The park is located close to the city of Tucson in Arizona. There are two sections, one to the west and one to the east of the city. They will both treat you to a beautiful landscape of cacti. 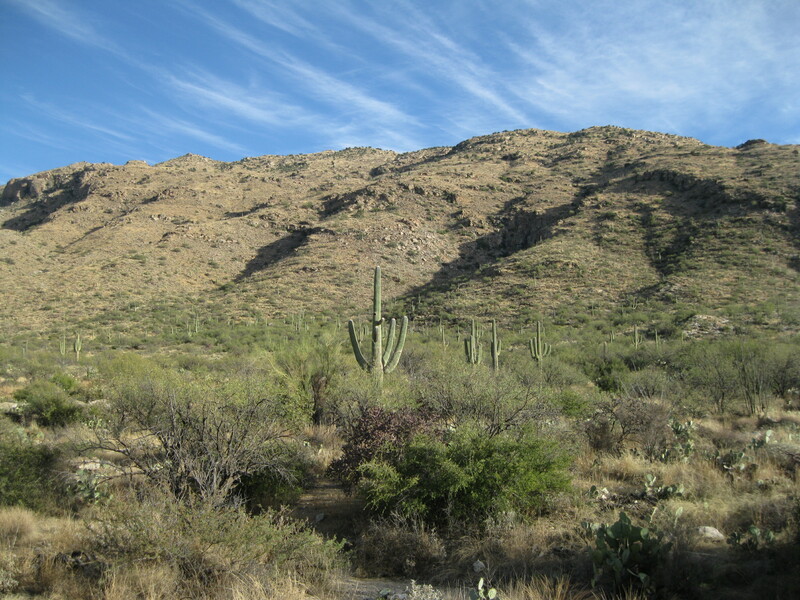 The western section is known as Saguaro West-Tucson Mountain District and the eastern section is called Saguaro East-Rincon Mountain District. The two areas are about 48 km (30 miles) apart. There are no campgrounds or overnight accommodation in the park and backpacking in the Rincon Mountain District is only allowed by permit at designated sites. Nearly 78% of the park and almost 90% of the Rincon Mountain District of Saguaro National Park is protected as official wilderness. It is a large and expansive backcountry without roads. As per the Wilderness Act of 1964, a wilderness is defined as an areas that is untrammelled by man, he is only a visitor and does not remain. It is protected and managed to preserve its natural conditions. The wilderness provides excellent conditions for wildlife where animals can find food, shelter and water. Common animals found here are the mountain lion, black bear and the Mexican owl to name a few. In 1880 the railroad arrived in Tucson and the city had to modernise. The demand for quicklime increased as there was a demand for bricks and mortar for new structures, adobe mud walls needed whitewash and dirty rooms needed plaster. In the desert you could find the required materials. On the hill above the kilns were located there was a limestone outcrop. Palo verde and mesquite trees were nearby as well. Furthermore there were ranch workers available close by. The kiln operators would cut the trees for the kiln. The kiln needed at least two wagon loads of fresh wood for each batch of lime fired. Once cooled, the caustic lime was bagged and shipped by wagon on dusty roads to the stores of Tucson. Ranchers used the land around the kilns for grazing livestock. Beans from the mesquite and palo verde trees were a major food sources. As the trees were cut down the harder it was to find the food source. 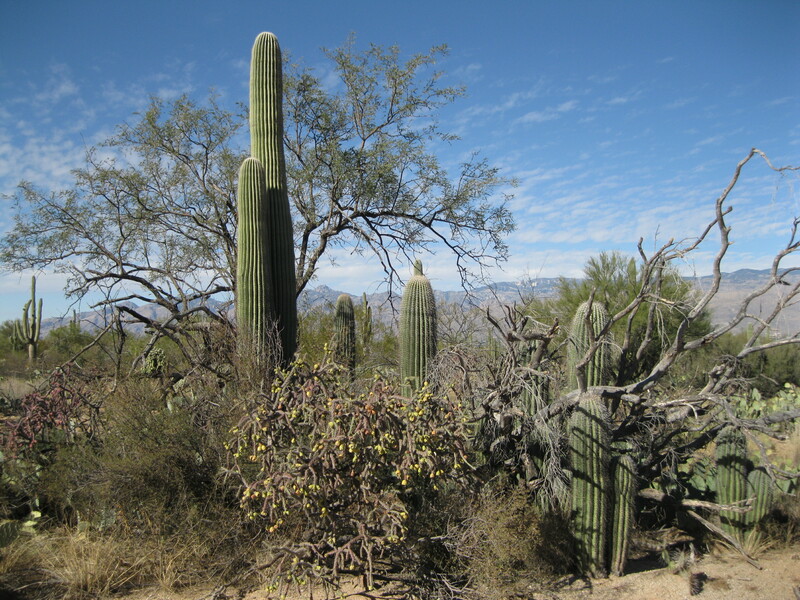 The trees were also vital to the Saguaros as they need the shade from the trees in the intense heat. Around 1920, a judge decided that the ranchers had the rights to the trees, not the kiln operators. This led to a closure of the kilns. Today the saguaros thankfully sprout again. Don Emillio Carrillo was a homesteader along Tanque Verde Creek in the 1870s where his family had ranched for more than 50 years. The ranch was named Buena Vista due to the magnificent view, on occasion Emilio would refer to it as Los Ganchos (the hooks) which was a reference to the cattle branding design that resembled the look of a wine glass. Howard Manning was the son of the mayor of Tucson in the early 1900s. The Manning family had a cabin in the Rincon Mountains which they used during summer holidays and it was perfect among the cool ponderosa pines. They would haul all the provisions, furniture, household equipment and even a piano up in wagons and on packhorses. The Escalante family ranched and ran the kilns until the 1920s. To run the kilns they needed intense heat and would cut down palo verde and mesquite trees to fuel the fires. As mentioned earlier, the saguaros need shelter from these trees to survive, so unfortunately this resulted in a lost generation of saguaros. The limekilns were made of mud and rock. The kilns would be filled with rock and wood. The latter would burn for a day or two to separate the lime from the rock. The lime would be brought into town to be sold to builders. 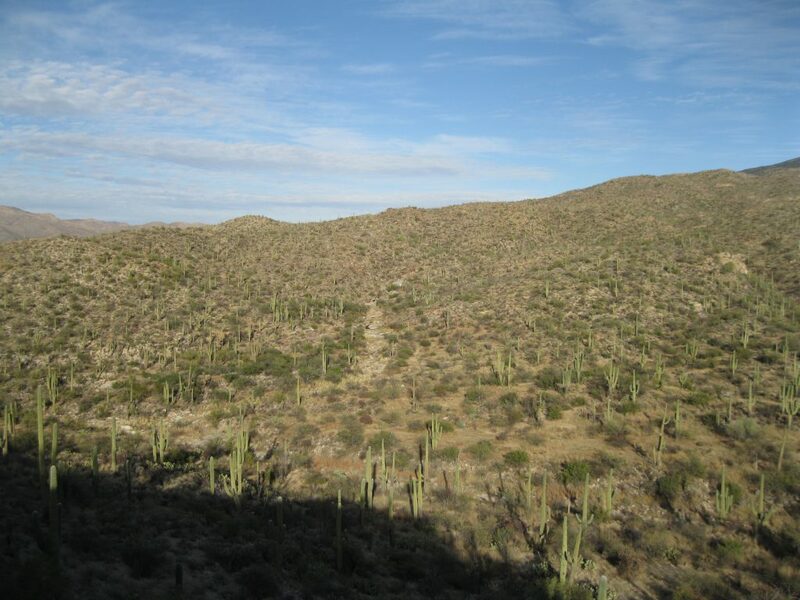 Due to extensive grazing and development in the 1920, the Saguaro forests began to disappear and mature cacti were chopped down to make way for new roads. Livestock trampled seedlings and added to the damage. 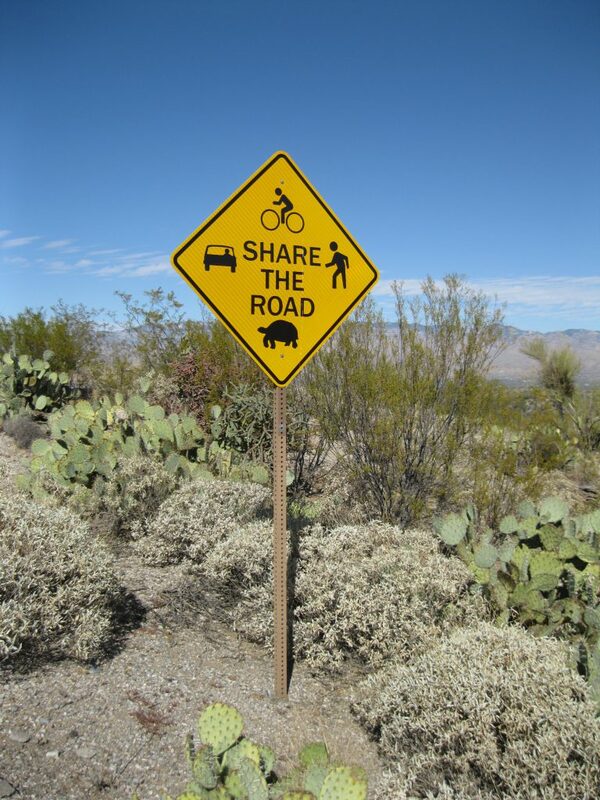 Thankfully on the initiative of Homer Shantz, Saguaro National Park was created. 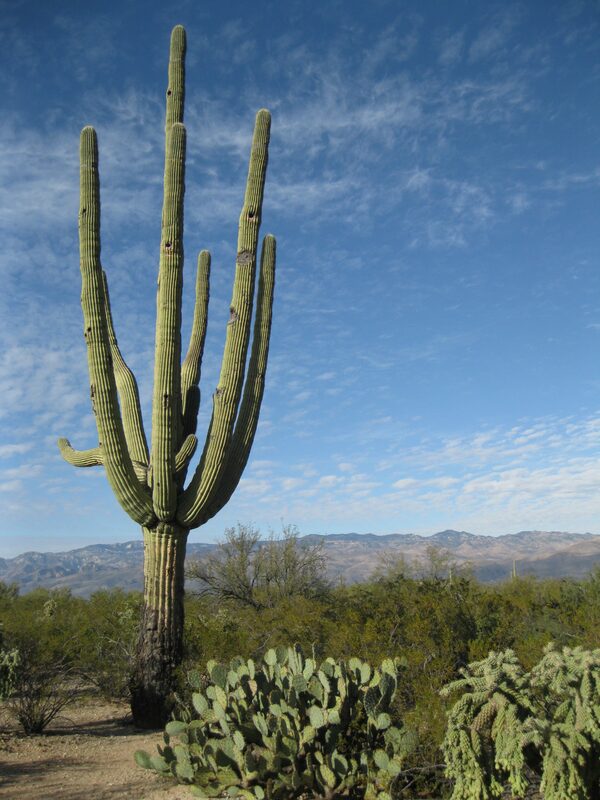 The campaign to gain protection of the saguaros started in 1928 and by 1933, president Hoover authorised the Saguaro National Monument in the Rincon Mountains. In 1961 president Kennedy added the Tucson Mountains to the monument and in 1976, congress designated about 289 square km (111.6 square miles) as wilderness. Finally, in 1994 congress established Saguaro National Park. The view of the cactus forest has changed dramatically over the years. In the 1930s it was the most spectacular cactus forest in Arizona. 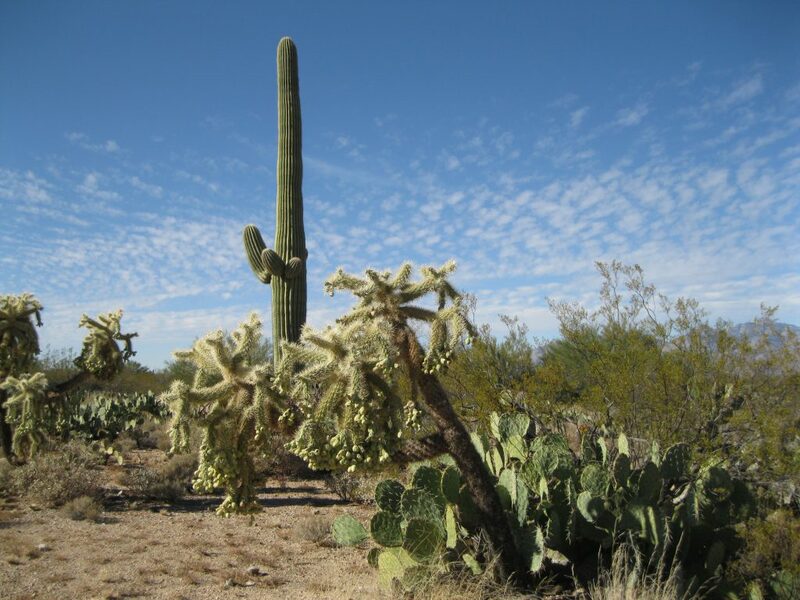 It is believed that it was mild weather during the late 1800s that led to the vast landscape of the massive cacti. In February 1937 record low temperatures were recorded in Tucson which resulted in an alarming rate of dying saguaros a few years later. 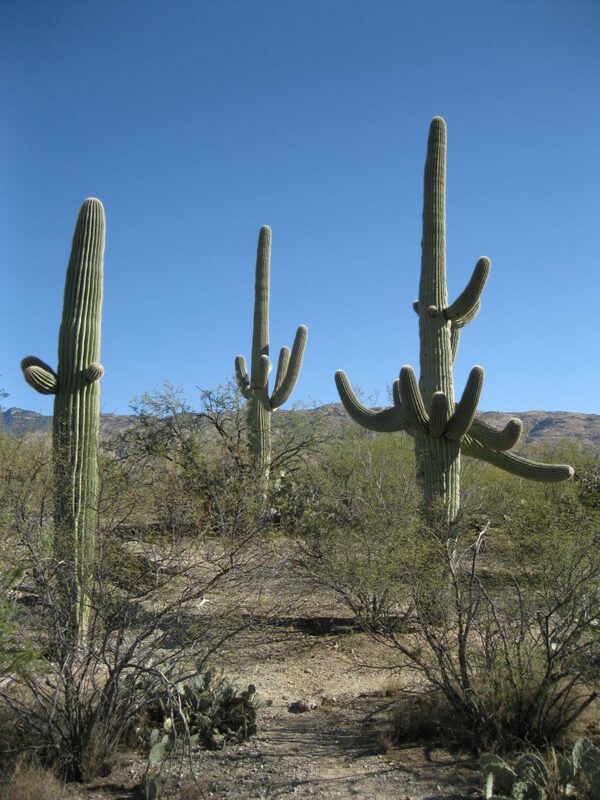 Following another fatal freeze in 1962, researchers realised that temperatures below freezing for more than 20 hours could kill saguaros. 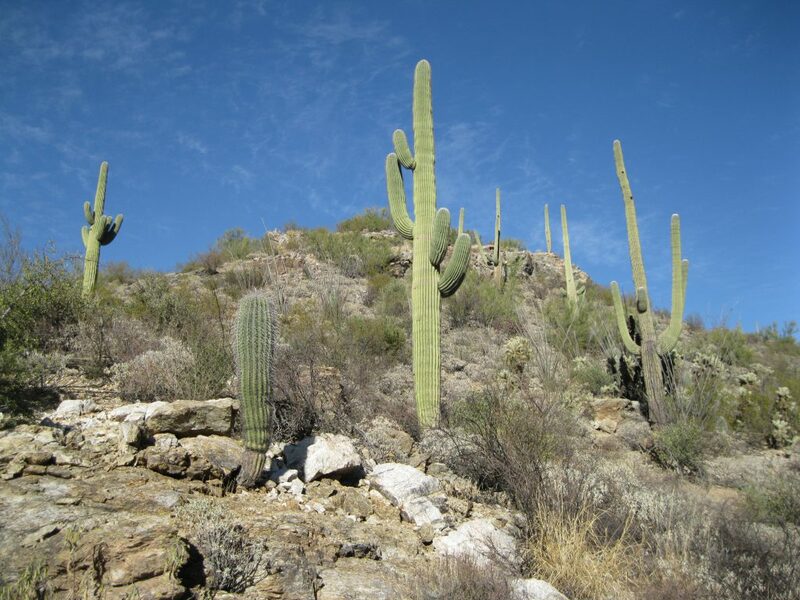 Until 1980 almost no young saguaros could be found in the park. It was feared that the cactus would die off before 1990. Therefore, in 1979 the National Park Service acquired all grazing rights in the Cactus Forest. Now as cattle would no longer trample through the forest, young saguaros began to sprout under palo verde and mesquite trees nurturing them. The trend of renewal has thankfully continued until today. 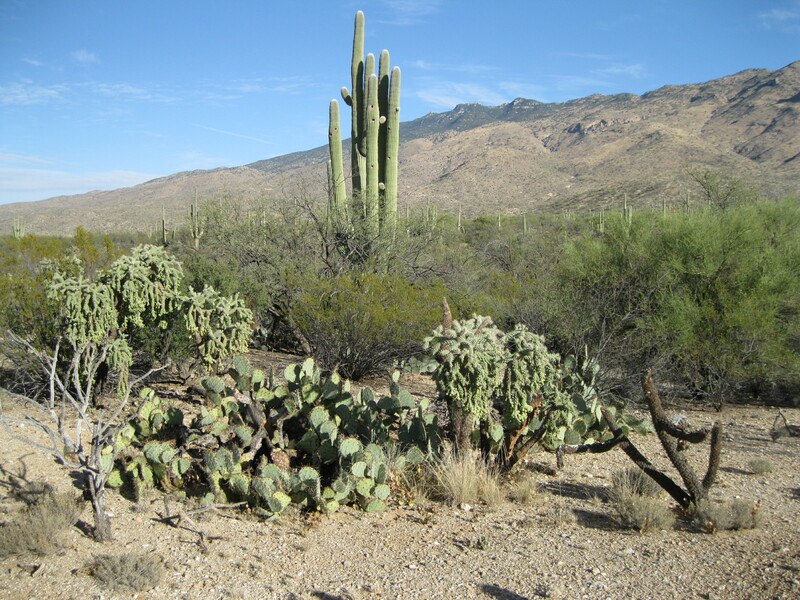 The park contains the most diverse natural cactus garden in the United States. The most predominant cactus is, as the name of the park suggests, the saguaro, the ultimate symbol of the American Southwest. The cacti are able to handle the extreme conditions of the desert unlike most other plants, such as the high temperatures and hardly any rain. Some cacti bloom in the evening, protecting fragile flowers from the intense heat during the daytime. The saguaro blossom is very beautiful and is also the state flower of Arizona. 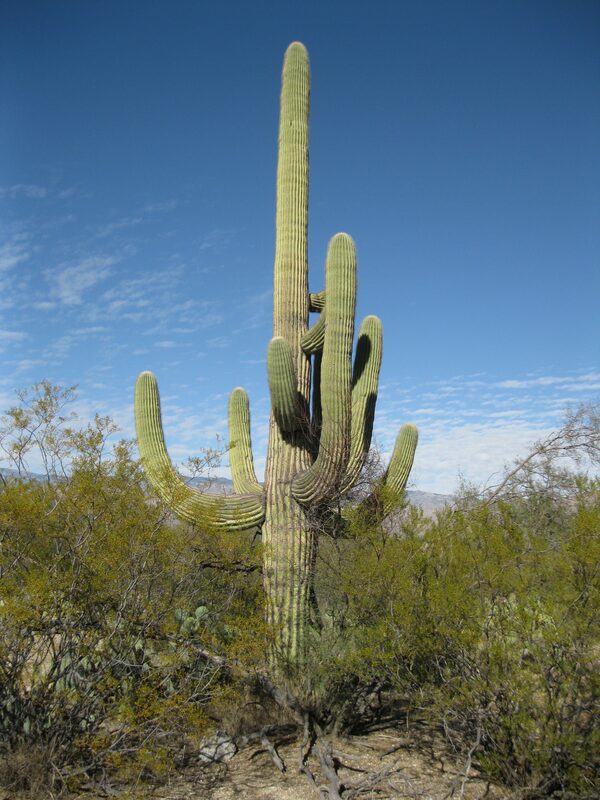 The saguaro cactus can be the home for different desert animals. Gila woodpeckers and gilded flickers carve into the cactus and create a residence for themselves which is about 9.5 degrees Celsius (15 degrees Fahrenheit) cooler on a hot day. When they move out, other animals will occupy the vacant space such as owls, purple martins and reptiles. Bats and doves pollinate the flowers and live off the nectar. 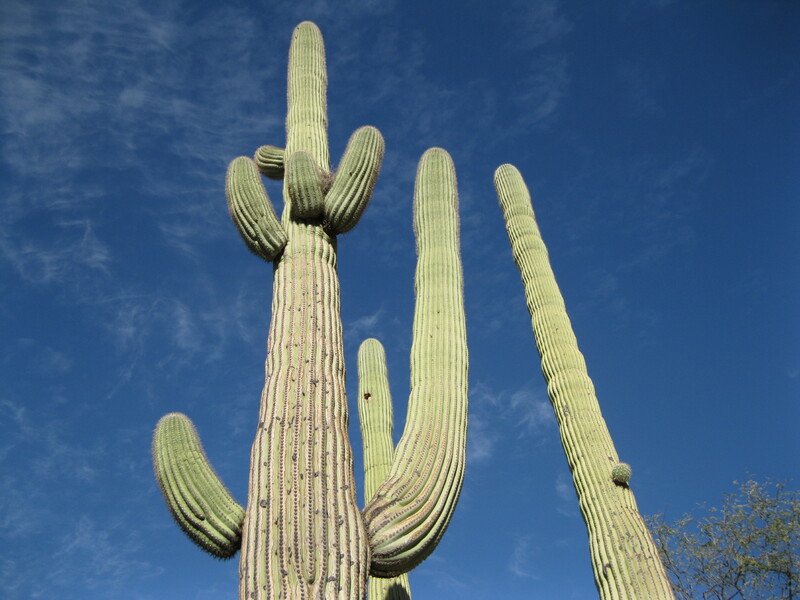 The saguaro sprouts are fragile, so they need shelter from heavy rains and the cold and hot temperatures. They find shelter under nurse trees such as the mesquite. This tree also adds nutrients to the soil to the benefit of the cacti. 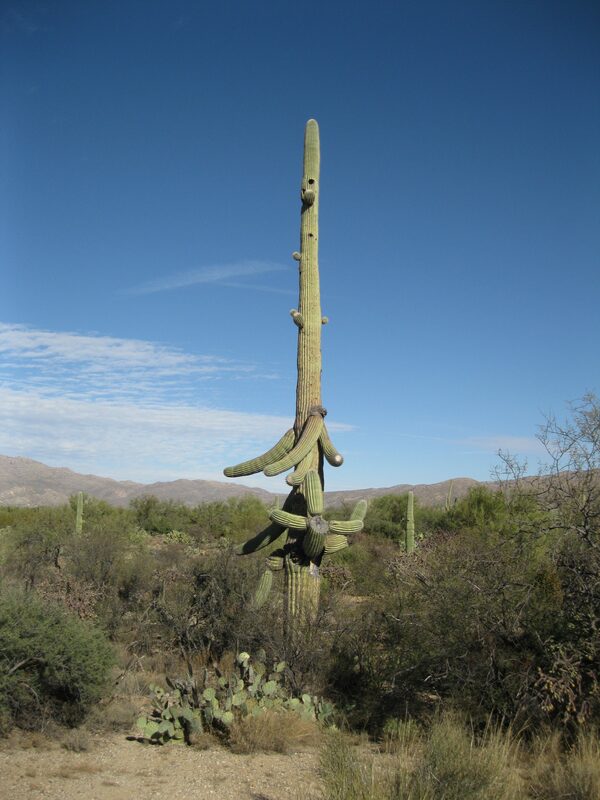 As the saguaros grow bigger and stronger their extensive and shallow root system competes for water with the deeper rooted nurse trees which may lead to the demise of the older nurse. The velvet mesquite plays an essential part in this desert. 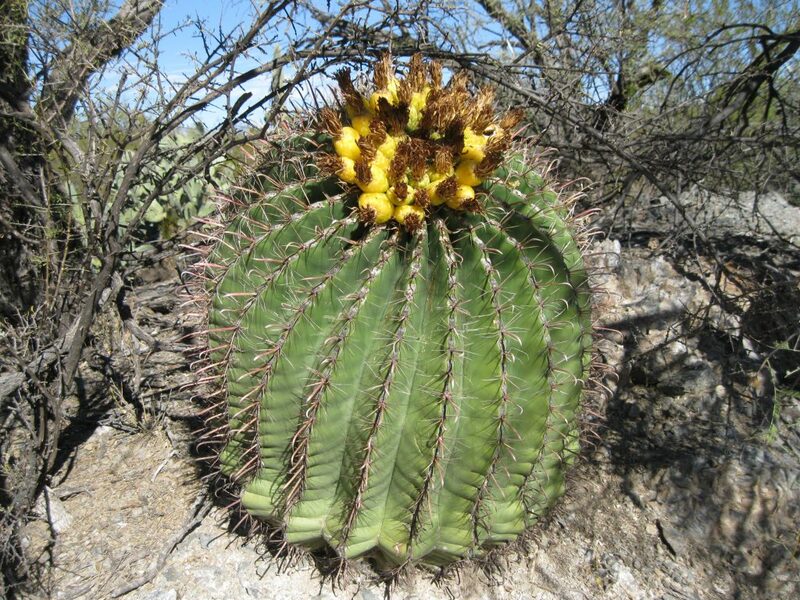 Not only is it a nurse plant for the saguaro but its seed pods are the food for animals such as the javelina, coyote and packrats. Ground-up mesquite pods make up a sweet flour and has historically also been a part of people’s diets. The prickly pear cactus is seen a lot in the park too. It’s got tough pads that grow vertical into the rays of the sun. The barrel cactus is also present and it stores water in its expandable stem. Another amazing cactus in the park is the cholla. 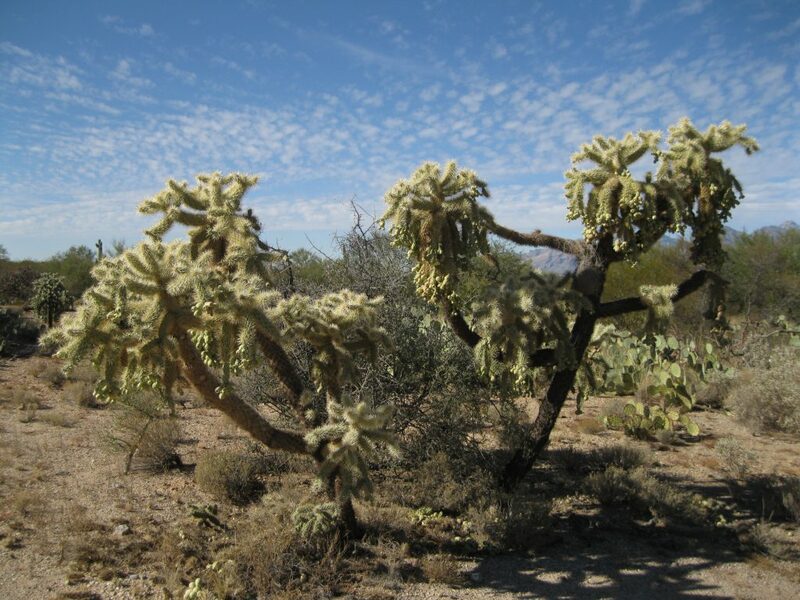 There are different varieties such as the chain-fruit cholla, the staghorn cholla and the teddy bear cholla. Absolutely awesome plants! If you see holes and debris at the base of the prickly pear cacti this will be doings of packrats. They collect all sort of stuff like seeds, cactus pieces, grass, pieces of rubbish and even car keys and pile it into their homes. They maintain their habitat for several generations, passing down their treasures to their offspring. Scientists have studied former homes of packrats in the area that are more than 40,000 years old. They have discovered seeds from grasses, pinyon pine and juniper trees that are only found in the mountains. Therefore it is likely that these areas was covered by grass, pinyon and juniper plants long ago. A native parasite seen in the park is the desert mistletoe. It takes root and taps nutrients from other desert plants but rarely kills the host plants but instead benefits the entire area by creating more diversity. It also provides shelter to birds and mammal species. Most trees in the park are of the legume family which work with bacteria in the soil nodules that have the ability to fix nitrogen in the air into a form of nutrient the plant can use. So the legume get extra nutrients and the bacteria get a good host plant to live on. Together they both have a better chance of surviving in partnership. They also release nutrient that other plants can use as well. The cholla cactus has a great way of spreading. Its spiny joints are loosely attached and are therefore easily broken off and transported by passing animals. Where ever the spines end up, it might root a new plant. As the spines of the cactus also makes the cholla protected it is also a perfect spot for the cactus wren to build a nest and raise their young. Few predators are willing to go near the spines. This desert is place we should all nurture. It’s an amazing community of plants and animals that have competed and co-existed for thousands of years and we should do our outmost to respect and protect it for the nature, ourselves and for future generations to enjoy. A high pressure system off the California coast is the reason for sunshine more than 300 days yearly. The very hot summers and mild winters both result in vital rains. The cacti and other desert plants are made for extreme but predictable climate conditions. The park experiences storms both during summer and winter. The summer storms are known as “monsoons”. The tropical moisture from both the Pacific Ocean and the coast of Mexican Gulf flows into Arizona. Heating of the air over the cooler mountain peaks by midday sun creates excessive thunderstorms. The storms deliver 51 mm (2 inches) of rain an hour. The washes fill up with massive floods that dry up quickly again afterwards. Lightning from summer storms have ignited fires in the mountains for thousands of year which is necessary for the clearing of dead wood and for thinning brush and releasing seeds. The winter storms are known as “equipates”. They are created over cold north Pacific waters and are sometimes directed south bringing rain for days into the valleys and heavy snow on the mountains. Even at an elevation of about 914 metres (3,000 feet), snow falls at least once a year. 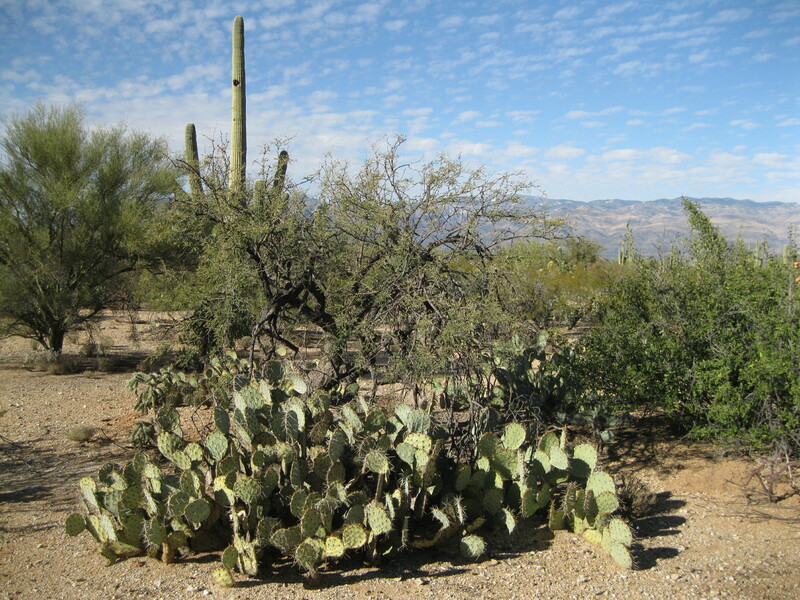 The subtropical climate gives the Sonoran Desert a lush plant life and two seasons of rainfall. If you are in the park during winter bear in mind that when the sun is out it is normally pretty hot but as soon as the sun sets it will get cold fast. So if you are planning to be in the park for the whole day and you’re leaving around sunset, bring an extra layer of clothes. 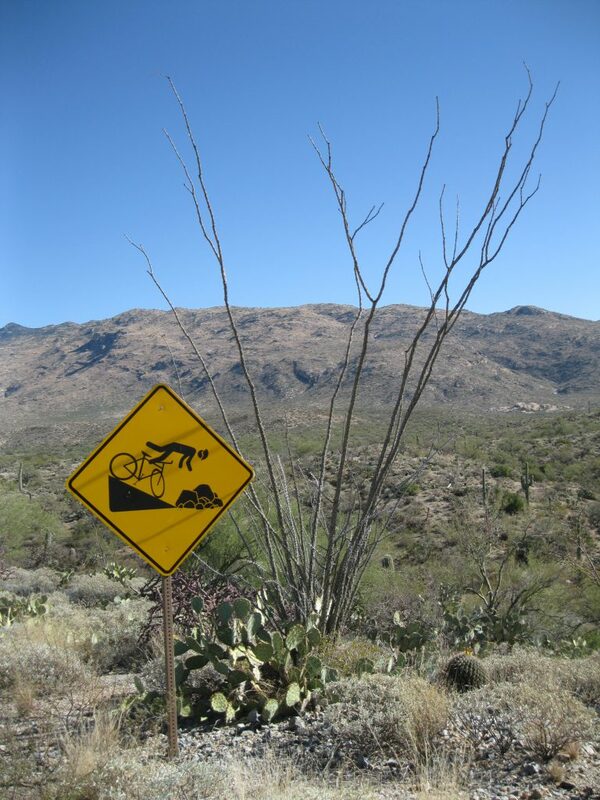 If you are staying centrally in Tucson, the best way to experience Saguaro National Park is by bike. There are several places in town where you can rent a bike. You can also go by car, but it is much cooler to be outdoors, riding a bike, getting some exercise and it’s so much easier to get off the bike to check specific sights out and take pictures. The city is very bicycle friendly. Riding a bike to the park is easy as there will be bicycle lanes pretty much all the way from the city centre to the park. The traffic is significant so be careful. It is not necessarily dangerous, but it is recommended that you wear a helmet. Better safe than sorry. The most spectacular part of the park system is the eastern section. If you are going from the city centre to this part of the park, head down to Broadway, ride all the way down until you see the Old Spanish Trail to your right, turn down on this road and continue all the way down to where it terminates and you will see a “National Park Service” sign and big sign saying “Saguaro National Park”. This is where the gate to the park is located. It is open between 07:00 in the morning until sunset. Mind you, it is said that you should be able to get out after sunset as they will keep one side of the park gates open. Don’t count on it though. Once you enter you have a short ride down to the Rincon Mountain Visitor Center. Definitely pay the center a visit as they have some educational displays on the park and you can get some great information. The staff is also really friendly and willing to help out if you have any questions. You can either do this before you explore the park or after. If you do it after, just make sure you get there before they close up. When you continue just a bit further down from the Visitor Center you will get to the entrance booth of the park. If you know somebody or meet someone entering who has a yearly pass or something of the like, you can enter with them free of charge and save the entrance fee. Once you get inside the park you will arrive at the Cactus Forest Drive. This is a 12.8 km (8-mile) one way loop, for the most part, which will take you on an awesome scenic ride. It is quite hilly so be careful when you’re going downhill and don’t go too fast if you are riding a bike. Also mind the cars going through. If you are driving a car you have to watch out for cyclists. The only part of the road that is two way is the last part of the loop where you have the option of continuing down to the Javelina Picnic area. So you could just head down there when entering the Cactus Forest Drive by going south instead of northbound onto the one way loop. As you make your way through Cactus Forest Drive you will notice some funny and unusual street signs that are definitely worth a picture. There will be several marked stops that are good for a look or a photo. Some are subtly marked by a paved curve. You will also find you own great spots along the way for sure. Furthermore there are several overlook areas with parking facilities. It is recommended that you stop here to have a good look at the scenery. As you drive along you will see several washes. When you see a really cool one, stop and have a hike down the wash and look closely as the scenery and the cacti. This will definitely add to the wilderness experience. Very cool. The first lookout stop will be the Sonoran Desert Overlook which will give you awesome views down the valley of a massive wilderness of cacti. As you continue further onto the loop, the next major stop will be the Cactus Forest Overlook. This will give you a great view of the valley and the neighbouring residential area. Being in the wilderness, it’s cooler if you cannot see any residential development. You will only have the view a residential area in this corner of Cactus Forest Drive. But the residential area is actually a “buffer” between the park and the growing Pima County where Tucson is the capital city. This will limit the growth of the city and thankfully leave more space for the desert. There is a danger of the neighbouring development becoming too big as it will damage the wildlife and nature. It is estimated that by 2040 Pima County will have 1.5 million in habitants and without careful planning these future neighbours the desert and wildlife will suffer with regard to water consumed and so on. As you continue further on the loop you will get to the next major area of interest which is the turn off to the Mica View Picnic Area. This is a two way dirt road leading down to a picnic area. If you have time this could be an option. You could also head a little bit down on the road, have a couple of stops and do a bit of bushwhacking into the forest and take some cool shots of the cacti and have a hike around. Taking up-close photos of the massive cacti is awesome. Then head back to the loop and continue onwards. The next major stop is knowns as the Desert Ecology Trail. Stop at the parking area and walk down the trail. There are some interesting displays that will educate you on the area and you will also have great scenery. 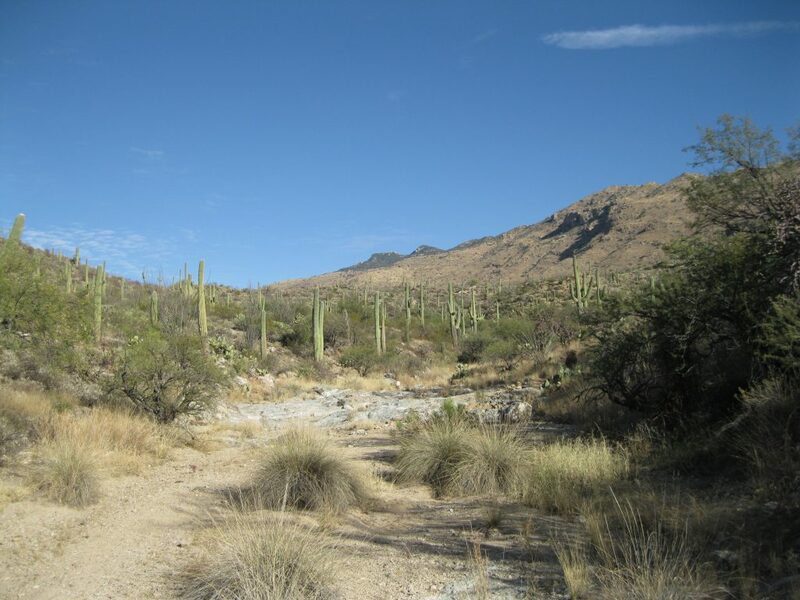 Not too far from the Desert Ecology Trail you will find the Cactus Forest Trail. This is an awesome place to stop and go on a hike. You can park you bike or car and the trailhead. It will lead down to several trails such as the Lime Kilns, the Cactus Forest Trailhead and the Irvington Access. Hiking down this trail is one of the highlights of the area. You will see many amazing saguero, cholla and prickly pear cacti with the Rincon Mountains as the backdrop. Astonishing scenery. 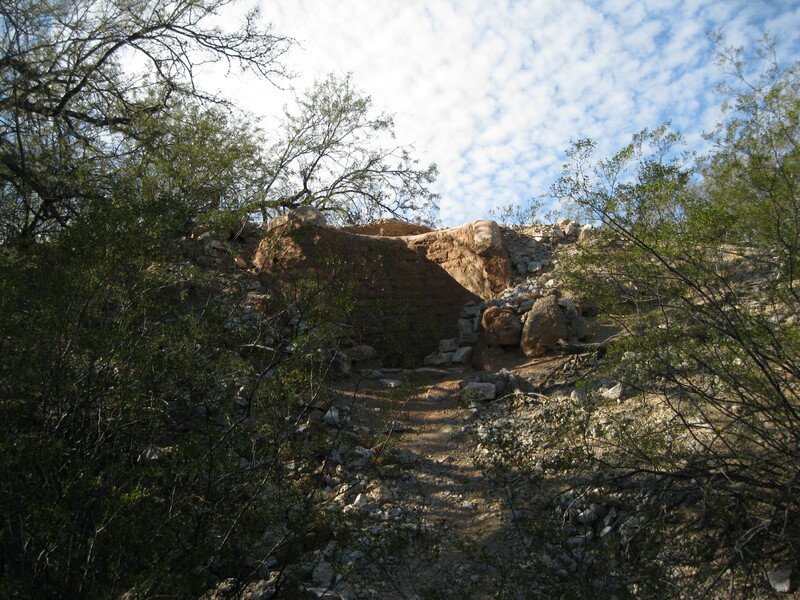 After a short walk you will get to a point where you can turn down Javelina Wash which leads towards the Mica View Trail or you can continue onwards to the Lime Kilns Trails. The latter is only 0.97 km (0.6 miles) away and is a great option. You will get to a point that leads you down to the Lime Kilns Loop Trail. This is for hikers only and if you have gone down the trail on your bike you should park your bike here to continue further. As you get onto the trail you’ll see come awesome old ruins. These are the historic kilns. When you are finished exploring the kilns you have several options to continue onwards. A great option is strolling down the Lime Falls Trail which is a 0.6 km (0.4 mile) walk. The further down the trail you go, the deeper you will get into a wash were you will be surrounded by awesome saguaros. 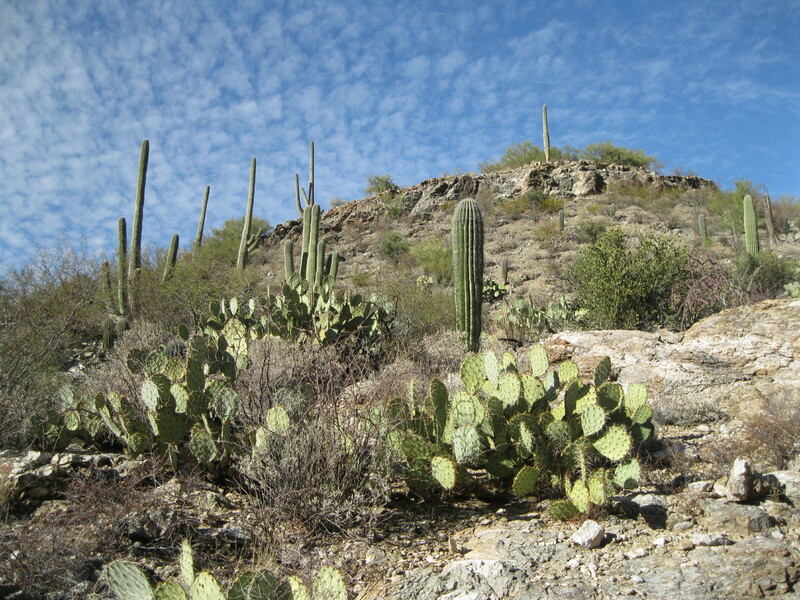 It will also get hillier and you will be exposed to awesome views of the massive cacti. You can get some great worm’s eye view of the cacti here. When you return from this trail you can walk down the Javelina Walk if you haven’t already done so. This is a cool wash trail deep into the park with a level view of the cacti scenery. The Lime Falls Trail or the Javelina Walk are not strenuous. Return to the car park you will have the Cactus Forest Trail – North not far from here with several other trails. If you have time you can explore these as well. You can also continue further up the Cactus Forest Drive to the Loma Verde Trailhead. This is the final major stop before you will start getting significant elevation on the Cactus Forest Trail. If you turn onto the Loma Verde Trailhead you will get access to another set of scenic loops. During spring you may be lucky to see a lot of wildflower if there has been sufficient rainfall. The saguaros will have their white waxy blossoms. The wildflowers prefer the cooler washes and shady areas. You may be lucky and spot mule deer or collared peccaries here. There are many trails but bicycles are not permitted in this area. Remember to bring plenty of water and food for long hikes and stay on the trails. Furthermore, wear appropriate foot wear, a hat and sunscreen. 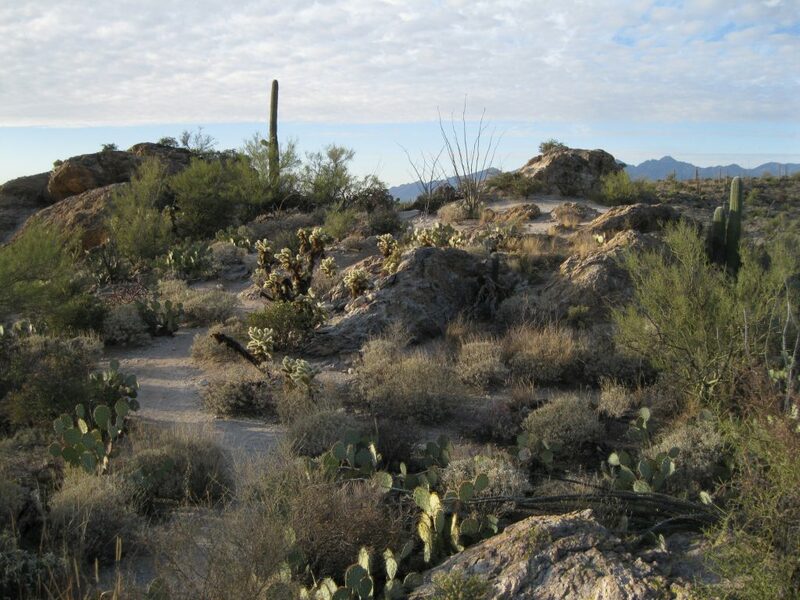 This is a part of the Saguaro Wilderness within Saguaro National Park, so be aware of rattlesnakes, mountain lions and bee colonies and swarms. Stay away from any mine shafts. If you want to camp you can get permits at the Rincon Mountain Visitor Center at the entrance to the park at the Old Spanish Trail. As you continue onwards from the point of the Loma Verde Trailhead on the Cactus Forest Trail it will be getting steep for a while. The next major stop is the Riparian Overlook. From here you will get an awesome look out on a small canyon of Saguaros. Look for big holes in the saguaros. These are hollowed-out nests made by gilded flickers and gila woodpeckers. The moisture of the tissue keeps the nests cool in the summer and warm in the winter. Once the original occupants leave the nest, the elf owl and other wildlife will take over the vacant homes. During the life span of a saguaro, many different birds will raise their young in these homes. During a year of normal rainfall, pools will appear in the side canyons giving life to desert aquatic creatures and even during dry periods they will exist in mud and sand. Rain and melting snow will fill the pools and year-round springs and seeps nourish the wildlife. The green tanks in the ridge above this point contains a series of waterholes with algae. The early ranchers were drawn to these mountains for reliable springs and high-country grasslands perfect for their cattle. The following major stop will be the Rincon Mountains Overlook. Here you will have a great view down the side canyon on one side and the valley on the other side. The area just above the ridge towards the Rincon Mountains is known as the Rincon Mountain Wilderness. Among these scrub brush and cacti you will find six different life zones from desert lowlands to pine forests at the top of the Rincon Mountains. Hiking through you may encounter animals not associated with the desert. From foxes to black bears looking for berries. The diverse environment provide home for a lot of different species. 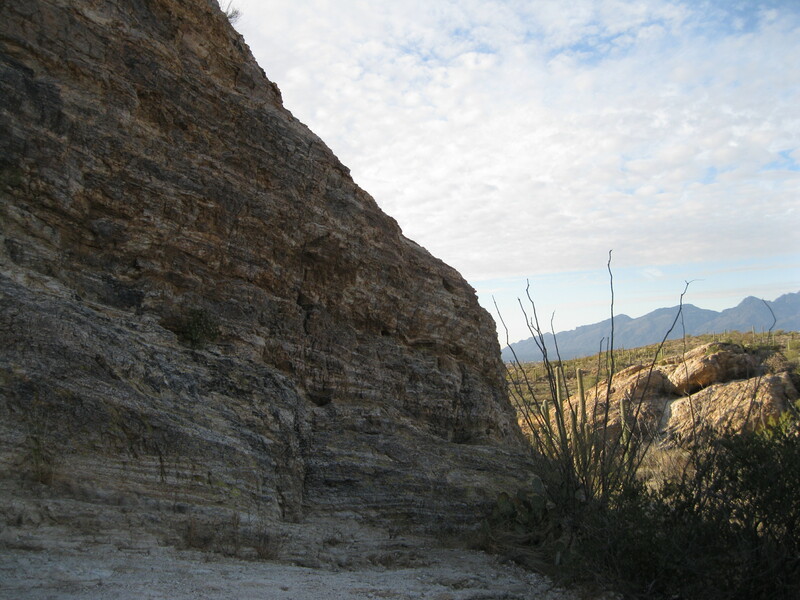 The next major attraction on the loop is the Javelina Rocks Overlook and the Javelina Rock ifself which is the layered rock seen here close to the parking lot. It is named after one of the residents of the park, the javelina, a pig looking animal using these rocks as its shelter. The javelina is actually not a pig but a peccary. The rocks are composed of an ancient granite called Catalina Gneiss. They have been changed by the forces deep in the earth along a detachment fault. It was raised to the surface and reveals bands of materials caused by the stretching movements of the crust of the earth. Check out the Rincon Mountains at the overlook. Then explore the area around the rock and the rock itself which you can climb. Note the awesome yellow lichens on the rock. If you ascend the rocks you will get a get a great bird’s eye view of the valley. A good opportunity for some great shots. The turn off to the Javelina Picnic Area is the next major point on the loop. You have the option of turning down here to head towards the Freeman Homestead Nature Trail or continuing on the loop. If you do the latter you will be on the only part of the loop which has two way traffic. The final major stop on the loop just before returning to the visitor center is the Desert Living Overlook. This land is full of hidden homes for creatures that adapted to the harsh conditions of the desert. Ringtail cat dens are found in rock crevices, prickly pear cacti can be the shelter for packrats or holes in the ground can lead to the gila monster. To survive in this inhospitable environment the animals have to be creative. Packrats sleep when the sun is high and with nests at the roots of the prickly pear cacti, they don’t have to look far for food. Then it’s just on your way back to entrance of the loop and if you haven’t already done so it is highly recommended that you pay the visitor center a vist on your way out.